This hijacking of the city’s government has been going on for quite awhile now, and is apparently being done without an Environmental Impact Report, because that usually takes years to complete: The Mayor has overridden this legal requirement in the interest of private-corporations that will profit by the changes, but it will kill the commercial corridors that have been in place since the city was built. There will be a hearing on it at City Hall on March Third, but they’re shifting the times around to avoid having to face the public on this killing change to small businesses. Hundreds of parking spaces, in this parking starved city will be eliminated to provide bike-lanes, while even more lanes reducing the number of lanes available for trucks and transport through the city on US 101, which is Van Ness Avenue will further destroy what’s left of the cities small businesses on or near this “revision”. All of these changes are catering to the Politically Correct criminals that have taken over city hall: In favor of the creatures that have invaded San Francisco but who work in Silly-Con Valley at the expense of the citizens of San Francisco. Three days ago the feds, who own and control BART, introduced a new wrinkle that’s now demanding one billion dollars from the citizens of San Francisco to “fix” BART, which has been mismanaged by the FEDs since BART began over forty years ago. If money is needed that badly then the people of San Francisco should take control back from the FEDS and demand two billion to not just fix BART, but to fire the feds and repair the system at the government’s expense: rather than to pay this additional blackmail which the government and the city are demanding from the people of the city—just to please Silly-Con valley and San Jose who want BART to serve them, but they’re demanding that San Franciscan’s pay for the increase to the City of San Jose. In that vein this city is losing over $300,000.00 a day in muni fees which the major dot com organizations have been getting ‘free’, because the City and the Mayor refuse to charge the tech communities for what it should cost them to take private buses, back and forth to work in San Jose. All of this is to keep these overpaid children ‘living in San Francisco’, while they commute in luxury, every day to that cesspool which is the valley they refuse to live in. Their reasoning is simple: The creatures that take seriously the title of “Land LORDS” are making a killing by renting apartments at fantastic rates which only those “special-people” can pay for. That is what has already drained this city of real people leaving San Francisco to creatures that treat this city as a tourist destination and not that “somewhere” that they actually live in. The mayor just added two dollars a pound to the cost of coffee in the city, because he believes that only the rich should be able to afford coffee. I asked around among the small businesses on Polk Street, which is being stolen, by eliminating hundreds of parking spaces that have always been there, to “support” the railroaded-in Van Ness Parking corridor that will cater to bicycles in the same way that the same groups have invaded London where they are killing the traditional cabs there, in favor of direct service by cell-phones which is killing commercial taxis. The same kind of thing has already begun here. Between the bicycles, all the new special lanes that have to take space away from actual traffic: The people who frequent the shops throughout the city will simply stop coming because they cannot park. 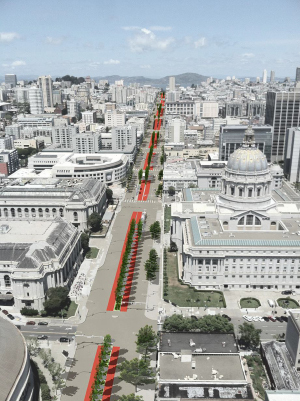 And with traffic becoming massively congested ­ because city streets on the downtown side of Van Ness have been forced to relinquish their current number of lanes to taxi’s and buses, while a new bike lane is introduced to further erode the already jammed city streets. I know for a fact, because I’ve known people who have been arrested for speaking against this city, that anyone who appears at the meeting on the third of March, will be subject to arrest and possibly jail: Without getting the chance to speak before the commission. One of the other “facts” now being exercised is that “Civic Center”, which houses City Government in San Francisco, has been privatized and therefore that corporation will totally control who will be allowed to attend the upcoming meeting, because San Francisco now belongs to a private corporation. Between the Billion Dollar extortion by the government, for BART, the invasion and theft of funds every day from MUNI, the cities bus service just to please the landlords and the totally corrupted city-government—not to mention destroying the cities cramped streets and already limited parking: When they finish with this San Francisco won’t even be a tourist destination any longer.